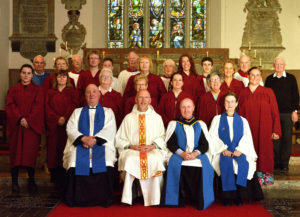 St Padarn’s is one of the few local churches to have an enthusiastic Church Choir, small but happy. We sing traditional, 4-part harmony music at the English Sunday service at 11.15 a.m. and at special mid week services. We meet in Church to practice on Thursday nights from 6.00 – 6.45 pm. led by the acting Choirmaster, Keith Jones. If you would like to join us to sing in St. Padarn’s Choir, please come along to choir practice. We need new members, especially Sopranos, Tenors and Basses. IF PRACTICE IS NOT TO TAKE PLACE, THERE WILL BE A NOTE TO THAT EFFECT ON THIS PAGE. Mrs Gwen Pugh stepped down from the position of Choir Mistress at the end of 2012. (Keith Jones is currently Acting Choir Master.) On 22nd March 2013, all of the available choristers assembled in the Black Lion on the village square to enjoy a meal together and pay tribute to Gwen for her service to the choir which dates back over 30 years. Archdeacon Hywel presented her with a cheque from her choristers and warmly thanked her for her services, noting that she had started coming to St Padarn’s when he was appointed Vicar at the beginning of the 1980’s. As a Parish, we warmly congratulate one of our Choristers, Professor Michael Hambrey —head of the Glaciology Department in the Institute of Geography and Earth Sciences at Aberystwyth University, on the recent announcement that Her Majesty the Queen has been graciously pleased to award him a second clasp to his Polar Medal. The award is in recognition of his continued outstanding work on glaciology which has contributed to the scientific service of the United Kingdom research and survey in Antarctica. Michael now joins an elite list of recipients who have earned the award a second time. You will hear very fine congregational singing in the Welsh service as there are many excellent singers in the congregation Sunday by Sunday. It was with great sadness that all in the church choir heard of the death after a cruel illness of Michael Dewe. Michael had been one of the stalwarts of the choir for many years and was the immediate past Choirmaster. His funeral was held on Monday 22nd December 2008 and the church was full with Mike’s family, friends, and colleagues. The church choir was at full strength for a moving and dignified service at which the Venerable Hywel Jones, presided, assisted by Father Paul, the Roman Catholic Parish Priest and his Assistant, Father Phillip and also by Mr Keith Jones, Reader at Llanbadarn Fawr. During the service three of Mike’s favourite hymns were sung and the Magnificat was recited. As a special tribute to Mike and to the glory of God, the choir sang the Ave Maria. After the last hymn—The day Thou gavest Lord, is ended– the Nunc Dimittis was also sung by the Choir. The robed choir then led the cortege, clergy and family out from the church and as far as the Lych gate. Mike will be greatly missed at St Padarn’s, especially by his colleagues in the Choir.